Since recent years, the concept of Speed Dating has become quite popular within our society. It offers strangers the opportunity to meet a large number of unknown people in a short period of time. The aim is to find a possible love match. For this reason, the Cambridge Dictionary defines it as „a way of meeting people for possible romantic relationships that involves talking with a lot of people for a short time to see if you like them“. You now might be surprised why a logistics company writes about Speed Dating on its blog. Sooner or later you will see, as we are about to create a once-in-a-lifetime experience at the 35. International Supply Chain Conference in Berlin from October 17.-19. With this in mind, are you ready to network and fall in love? We find ourselves in a world where everything has to happen immediately. Meanwhile, we have less time for doing things we enjoy the most. For this reason, we are in high need for efficiency. Thus, it is no surprise the concept of Speed Dating has also taken over the business world. Not with the aim to find people you can actual date, but rather with the aim to network and share knowledge. It is fact, that networking is one of the most powerful and important activities. Every professional has to network in order to push their career. Meeting interesting people in the most efficient manner therefore does not only sound appealing but also fits to the spirit of age. As a result, events structured in the Speed Networking manner are fast paced conferences. They allow attendees to interact with each other face-to-face. Henceforth, this format provides closure in a short amount of time. Moreover, it provides information on who you are, what you are looking for and what you have to offer. It can lead to acquiring new customers, businesses or pave the way to powerful collaborations. It is Log-hub’s mission to make Supply Chain Planning as easy and efficient as possible. Accordingly, we want to involve you in such an event. We give you the opportunity to connect with our experienced Supply Chain specialists. 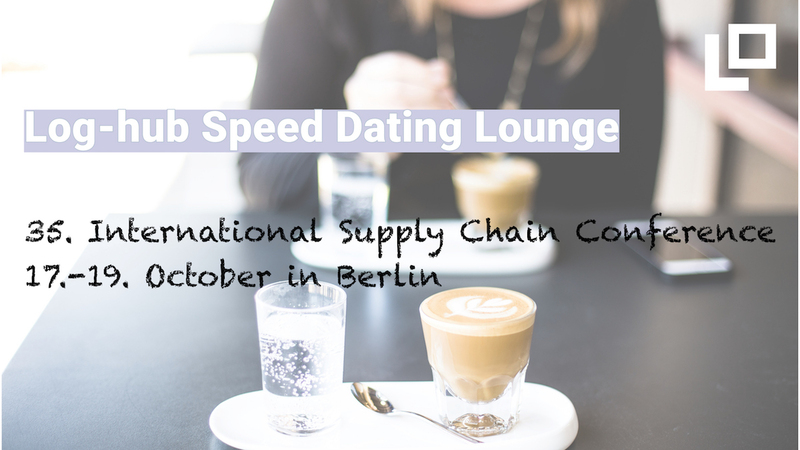 Therefore, we are delighted to announce that we are adapting the Speed Dating format at the 35. International Supply Chain Conference in Berlin from October 17. till 19. Let’s get ready to network! Our international team of passionate logistics expert from throughout the world will be on site to exchange information with you. Your Speed Dating companion can be anyone out of our steadily growing partner network. Also our CEO and our CTO will be there. As well as our Board members. Are you excited yet? Whether you have a specific Supply Chain problem or not, our experts give advices on all strategic and operational solutions to improve your Supply Chain profile. Pay us a visit in our Speed Dating Lounge, network and discuss the newest trends and developments within the industry. Let’s talk about… Supply Chain Apps, Baby! Provided that we share similar interests, we are convinced that there will not be any quiet minutes. Our experts are delighted to talk with you about our Supply Chain App Portfolio. We are highly interested in Supply Chain Analytics, such as Data Integration, Data Science and Predictive Analytics, too. Further we cannot wait to introduce you to the world of blockchain applications within the Supply Chain. Also On-Demand Warehousing is a topic closely tied to our hearts. We know that efficient supply chains need to be dynamic due to volatile market developments — we also know that every market has specific requirements. This is why our team is so diverse: Our worldwide, passionate local representatives have profound country-knowledge by hand. Check out our global network to find your possible network/love match even before the conference starts. Prepare yourself to ask them anything you want to know. Maybe you also want to become a Log-hub partner one day? Speed Networking is Speed Dating for professionals. So be also prepared to fall in love with our Supply Chain solutions and do not forget your business cards. You might need them. If you cannot wait till the conference, you might as well check out our Supply Chain App Portfolio here. Download our App Portfolio right now in the Microsoft AppSource to have specific questions by hand. In this case, we are convinced you will have plenty of stuff to talk during the Speed Dating event. Our logistics experts are happy to support you! The 35. International Supply Chain Conference will take place from October 17.-19. 2018 in Berlin. 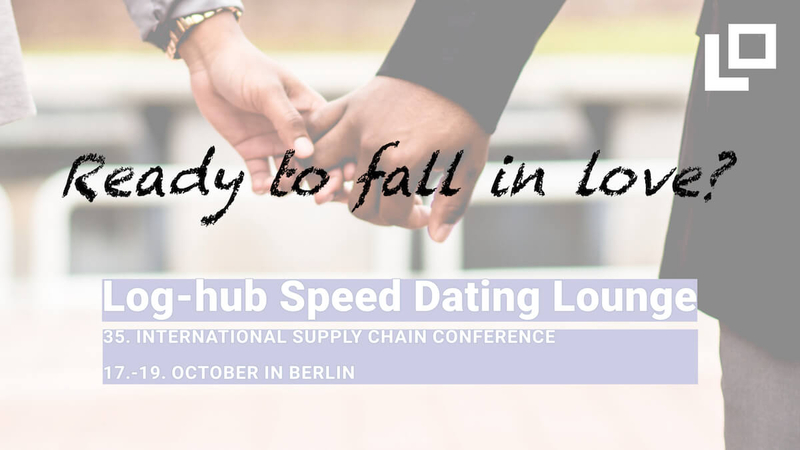 Visit the Log-hub Speed Dating Lounge and spend some quality time while learning all about our innovative Supply Chain Apps.